Dress: The dress is made from heavy watered silk, with three rows of gathered ruffles at the hem. The ruffles may be of the same fabric or a coordinating fabric; from their more wrinkled texture, my guess is that they are a taffeta. The ruffles are finished with a large (about 3/4″ wide) scallop, which was a popular edging at the time. The woman wears a wide (about 3″) flat collar with some texture, indicating that it is lace or embroidered, and a slightly ruffled edge. Note how she has placed the collar on top of her wrap. She also wears full undersleeves, though details are not visible. The dark spot below where her collar meets in front may be a brooch, but because it is much lower than most brooches, I think it is probably a button. It may also be the hanging portion of a brooch. Outerwear: She wears a mantle, which is in a style that was popular throughout the 1850s and into the 1860s. 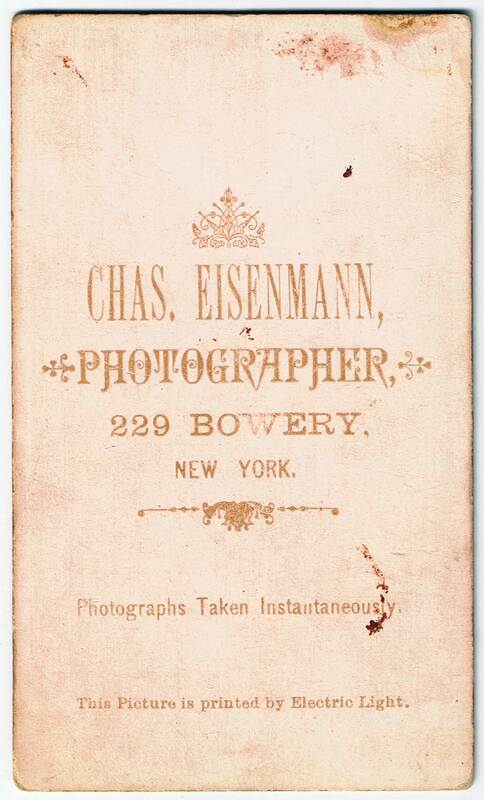 (In fact, it survived in some form for most of the Victorian era). This style mantle is characterized by opening in front, being slightly fitted over the shoulders, shorter in length over the arms, long tabs in the front, and a full back designed to flow over the full skirt. The back of the mantle could range from just below waist-length to almost the knees. This mantle also has a ruffled edges extending from the very elongated shoulder-line to her waist, where she holds it in place. The fabric of the mantle is difficult to discern. Some texture on her left arm appears to be lace (likely Chantilly lace, which was wildly popular). Although most chantilly lace was worn as a simple triangular shawl, there are plenty of extant examples of cut-and-sewn garments from the lace to make it possible that this is one. Hair: Her hair center-parted and arranged in several loose, curl-like rolls towards her face. Her hair is at its widest between her temples and chin, which was the fashionable shape throughout the 1850s. She is wearing some sort of headdress, with chenille or tassels of some other material hanging stylishly at the side. 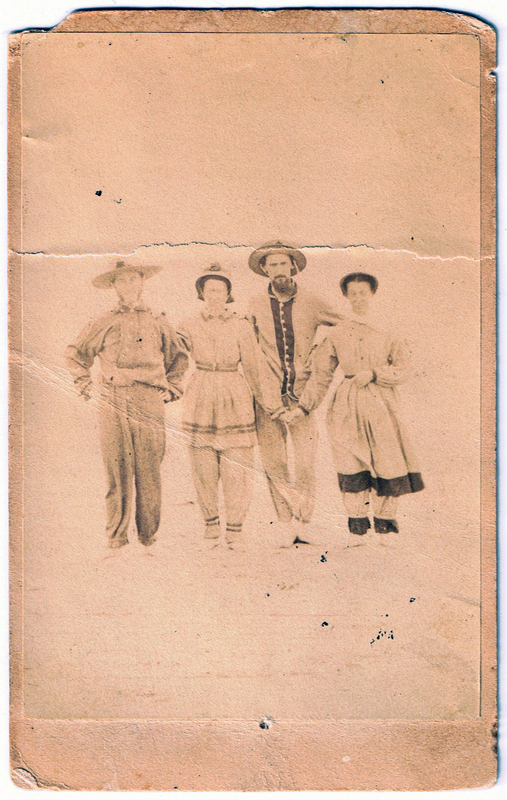 Two men and two women on beach, c. 1860-70. Man on the Left: Appears to be wearing a loose wool shirt with center front placket extended to just above waist level. The placket closes with 4 visible buttons. A fifth button on PR neck indicates a possible placket extension. Shirt has collar and very full sleeves that bunch around the wristband. Shirt is tucked into trousers and bloused. Trousers of wool, probably matching shirt, with front opening with visible buttons. Trousers are full, gathered into ankle with a band and ending with a short frill over the foot. Straw hat with chin strap. There is a dark spot on the front crown, significance unknown. Woman, Second from Left: Short dress, probably wool. 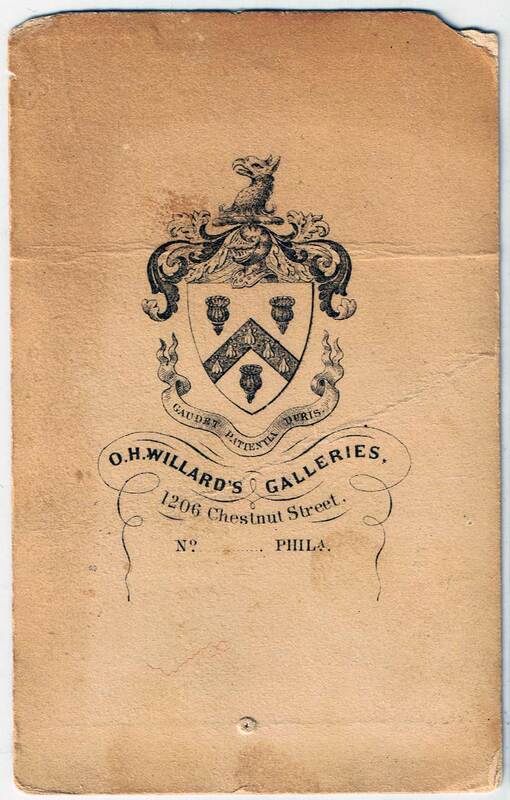 Flat collar about 2″ wide with dark trim at edge. Bodice bloused slightly into belt at natural waistline. Belt of self fabric trimmed at top and bottom with same trim as collar. Full sleeves ending at wrist, banded with contrast trim, with short ruffle over hands. 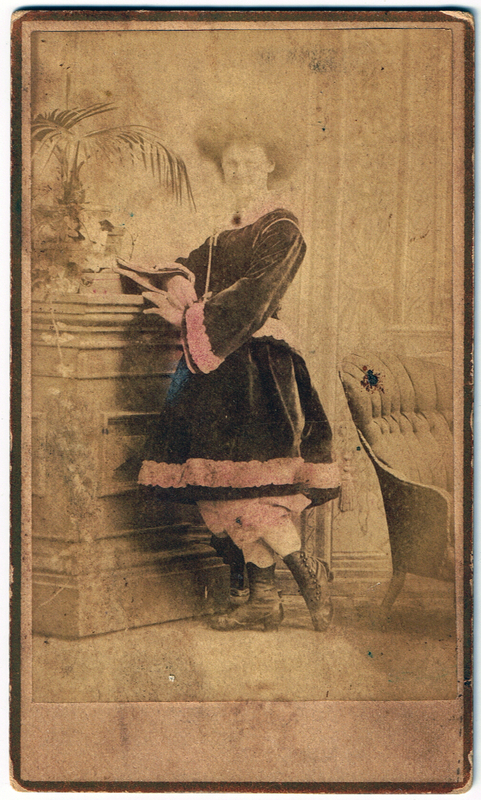 Skirt is pleated (possibly cut all in one with bodice, basted at waist into pleats); knee-length, trimmed with two horizontal stripes of same trim as elsewhere. Pantaloons are full, probably modeled on young children’s drawers, with openings at either side, and buttons fastening at the waist. Pantaloons are full, gathered at ankle with two stripes of coordinating trim, with a ruffle over the foot about 3″ long. She wears her hair bound, and a straw hat, possibly pulled down at sides to tie under the hair. May also be a bonnet in the typical style, with bavolet and rosette at top. Man, Third from left: Hip-length shirt, probably of wool. Opens all the way down center front, with a contrasting (dark) panel of fabric and twelve contrasting (light) buttons. Dark material is bound with contrasting braid along all edges, including center fronts and collar. Center front at waist slightly rounded. Cuff not visible. Shirt is untucked. Trousers of fabric probably same as the shirt. Moderately full, banded at ankle with contrasting (dark) fabric or tape, with contrast (dark) placket and light button at inside ankle. No ruffle is visible. Straw hat with chin ties, loosely knotted. His has is tipped slightly back, showing just enough of the crown to reveal a dark spot in the same shape and size as the other man has. Woman, far right: Dress, probably of wool. Buttons up front with widely-spaced, contrast color (dark) buttons (probably four total). Neckline not discernible. Sleeves pleated at armscye and pleated into contrasting band at wrist, with no discernible ruffle. Thin belt of contrasting fabric. Skirt pleated; ends midway between knee and ankle. Bottom of skirt decorated with wide (5-7″) band of contrasting fabric. Trousers end at ankle, gathered into loose bands of light-coloured material, with similar band of contrasting fabric falling over tops of the feet, Hair is center parted and bound up, and she wears a bonnet or hat pulled down at sides to form a coat-scuttle shape.